/ Vivere Pescia / Collodi "il paese di Pinocchio"
Nella parte alta del paese si trova la Chiesa Romanica di San Bartolomeo,la cui torre campanaria un tempo doveva far parte del sistema difensivo, di cui rimangono parti delle mura. Questi ed altri caratteristici dettagli del borgo, perfettamente conservato grazie anche al divieto di transito dei mezzi a motore, si possono ammirare percorrendo a piedi i suoi vicoli lastricati in pietra. Un luogo affascinante che accosta ai fiori e alle geometrie del giardino barocco i "fiori volanti" cui sono simili le farfalle, e la pura, luminosa geometria della struttura che le ospita. Qui si possono vedere tutti gli stadi di sviluppo dell'insetto (uovo, bruco, crisalide e farfalla), osservare le differenze tra le farfalle diurne e le notturne, (falene), rcompredere come le ali variopinte servano a difendersi, a nascondersi o a rendersi visibili per un potenziale partner. Soprattutto, si constata come si può modellare la natura anche in modo costruttivo, ricostruendo e conservando un equilibrio delicato tra varie forme viventi. il Pinocchio in legno più grande del mondo,collocato nel 2009 in uno spazio aperto al pubblico accanto al Parco di Pinocchio:un'opera stupefacente, alta16 metri erealizzata su commissione della Fondazione Nazionale Carlo Collodi dall'Atelier Volet, azienda del cantone svizzero di Vaud specializzata in costruzioni complesse in legno. Per chi ama le camminate in campagna, da Collodi è possibile raggiungere Pescia (o viceversa) percorrendo la caratteristica Via della Fiaba, un itinerario non impegnativo di circa un'ora e mezzo che per un tratto percorre una via romana, e permette di ammirare il panorama campestre impreziosito da ville rurali ed ulivi. Every season is perfect to visit Collodi; indeed, the centre always offers attractions not to be missed. It is a place rich in historical memories and beauties; furthermore, the village is linked to the life of Carlo Collodi, the Adventures of Pinocchio's author since his mother was born there. When he was a child he used to live in Collodi and he came back there several times as an adult, living with his mother's family. He chose Collodi as his pseudonym to sign his works. Today, all over the world, speaking of Collodi means remembering Pinocchio and his author, the main characters of a global literary success. Getting nearer to the village, you can see the ancient hamlet or Collodi Castle, situated 244 metres above sea level. Documents about the castle dating back to the end of the XII century have been found, referring to it as a military village since it was on the border between two rival territories, the territory controlled by Lucca and the one under Florence's influence. Collodi was contended between Lucca and Florence for a long time, until in 1442 it became a fortified outpost of the Republic of Lucca. Collodi Castello looks like an actual "fall" of small houses, climbed along the slope of a steep hill, almost sustained and prevented from falling by the imposing baroque architecture of Villa Garzoni,built on the ruins of the medieval castle. In the upper part of the village is the Romanesque church dedicated to Saint Bartolomeo, whose belfry was probably a part of the defensive system. A few parts of the defensive walls are still visible. These and other typical features of the hamlet, perfectly preserved also thanks to the "no entry" sign that denies cars the access to this area, you can admire its lanes paved with stone. 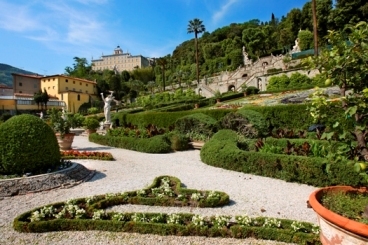 Villa Garzoni together with the surrounding Garzoni garden has been labelled as "national monument". It is a Baroque-style garden, dating back to the XVI century and subject to several restoration works, the last ones carried out in 2007. It stands out for its position on the slope of a hill, for the richness in statues and water plays. In its lower part, it opens up with a French-style parterre, bordered by flowerbeds, mythological figures and two big circular pools. From the first terrace, charming two-flights stairs lead to the three upper terraces, with an artificial cave and stairs of water. On the top, there are two female figures possibly representing Lucca and Florence, the eternal rivals and surmounded by a statue representing "fame" that blows into a shell from which a stream of water flows. The hydro-system was designed by the scientist Ottiaviano Diodati from Lucca, also well-known for publishing the first Italian version of the "Encyclopédie" by Diderot and Alembert, encouraged by the Archbishop Mansi. You may visit the garden, but not Villa Garzoni which is only visible from the outside, with its small tower and some statues on the roof. Many typical buildings surround the garden, such as farms, agricultural storehouses or cellars. The most peculiar one is the Bagnetti building, where the noble family inhabiting the villa and their guests, delighted by a small orchestra, could enjoy a pleasant bath in the tubs dug into the floor. The sole contemporary element in Garzoni garden is Collodi's Butterfly Hosuse, a beautiful building/greenhouse made of stone and plate glass. 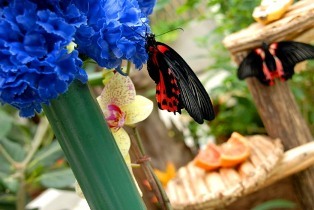 Here, the visitor finds himself in the midst of a marvellous exotic garden where dozens of amazing butterflies court, feed on flowers and reproduce every day. These butterflies are among the biggest and most beautiful in the world, species coming from tropical or equatorial areas. A fascinating place that combines flowers and the pure, bright, geometrical structure of the Baroque garden to the"flying-flowers" that look like butterflies. Here, each stage of butterflies' development is visible (egg, caterpillar, chrysalis and butterfly); it is possible to observe the differences between diurnal and nocturnal butterflies (moths) and understand how they use their colourful wing to defend, hide or show themselves to a potential partner. In particular, it can be noticed how nature can be modelled in a constructive way, reconstructing and preserving a delicate equilibrium among various living beings. A few metres from Garzoni Garden is Pinocchio's park, a place of art, architecture and leisure, where the art of gardens, sculpture, mosaic, and architecture makes everyone experience the Adventures of Pinocchio's charm and poetry. The Park is the result of the collective work of some among the most important Italian artists and architects of the 19th century. Its planning began in1951 by a national committee headed by Professor Rolando Anzilotti who was the Mayor of Pescia at the time. Emilio Greco with "Pinocchio and the fairy" and Venturino Venturi with "The small square ofmosaics" won ex-aequo the national contest sponsored by the Committee. In 1963, the "Osteria del Gambero Rosso" (literally the "Tavern of the red shrimp"), conceived and planned by the architect Giovanni Michelucci, opened. In 1972, inside the park, the so-called "Paese dei balocchi" (literally "toys village") was built, a walking path through the various stages of the Adventures of Pinocchio. There also are the "Lab of words and figures", conceived by the Architect Giovanni Michelucci, an exhibition centre for temporary exhibitions dedicated to art and childhood and play areas with vintage carousels for children. Everything in Collodi reminds of Pinocchio: the monument dedicated to Carlo Collodi, the "Painted walls" made by some important Italian contemporary artists in 2006 and, of course, the wooden scuplture of Pinocchio which is the biggest in the world. This wooden sculpture, located next to Pinocchio's Park, is a spectacular work of art, 16 metres tall. It was made on Carlo Collodi National Foundation's commission by the Volet Atelier, a firm specialised in complex wooden works and located in the Swiss canton of Vaud. For those who love walking in the countryside, you should take the time to walk through Via della Fiaba (literally "fairytale road"), a one hour and a half trekking route that also passes through a Roman road and allows to admire the countryside view, embellished by the presence of rural villas and olive groves.